Coolclogher House is a beautiful Irish Manor House, located on the famous Ring of Kerry, amidst the most breathtaking scenery in the Ireland. 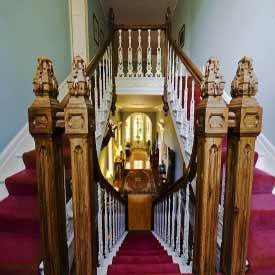 An historic and listed buiding, Coolclogher House offers guest accommodations in a haven of luxury and tranquility. Nestling in the beautiful surrounds of stunning lakes and mountains of Killarney and within walking distance of Ross Castle and the 22,000 acre Killarney National Park – what better way to enjoy a vacation on the Ring of Kerry. Coolclogher Manor House is set in 60 acres of walled gardens and parklands and has been carefully restored to its former splendour. Completely secluded from the bustle of Killarney town and in the centre of one of Ireland’s most beautiful tourist locations, Coolclogher House provides guests with the best and most secluded accommodation currently available in Killarney. Guests will find themselves spoilt for choice as Killarney is justly famed as the ‘Gourmet Capital of Ireland’ with numerous restaurants offering a wide choice of foods for all tastes. Bedrooms are large and beautifully appointed with wonderful views of the lakes and mountains. Reception rooms are spacious, stylish and comfortable where guests can relax in front of log fires and read some of the many books and guides available. The house also includes a Victorian conservatory, built around a huge specimen camellia, more than 170 years old. 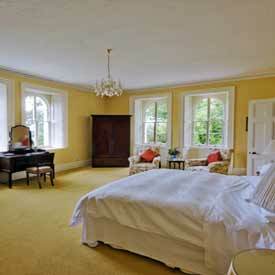 Coolclogher House also provides a perfect base for day trips to the Ring of Kerry, Dingle, Kenmare and Glengarriff. Local attractions include fishing, climbing, hill walking, cycling, horse riding, theatre, festivals and traditional music. Guests at Coolclogher House will also find themselves in the midst of a golfer’s paradise with many world famous golf courses a short distance away, at Killarney, Waterville and Ballybunion. From Killarney take the Muckross Road (N11), take first left turn into Mill Road (after metal bridge). Gates on right after half a mile. Ideally situated for Ring of Kerry route. Secluded location within walking distance of Killarney.